Very Good. 1620973928 Little edge wear. 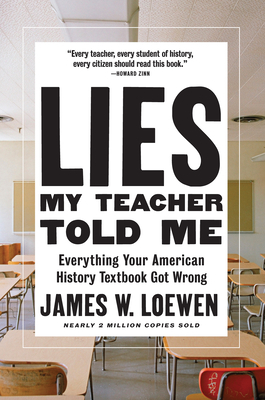 Significant research detailing the errors found in conventional history books and courses. A wonderful companion to works of Chomsky! I bought this book thinking that I would learn a little bit about history and the world. Instead I learned that 12 history books that the author reviewed didn't tell us the whole story. No? Really? Well... Tell me something then. Written by a smug author who did nothing but bore me with constant complaints about how bad things are but did NOTHING to enlighten the reader. kind of sad... I bought it to read by the pool and it was so bad I threw it away after a couple of days... I didn't want to subject someone else to the author's bad attitude. Purchased for my son in law (a secondary social studies teacher). He found it a great resource and said as time goes along, american historians are writing the truth about events in our past. Especially chapters on the treatment of blacks and indians in this country and some of the "Heroes" that were not such heroes. Would like to see a similar book written on the changes in our Science understandings since the 60's. This book was far more than I expected. Although I already knew a little of what the author wrote about, I was engrossed with all the further information he gave me. The book is written, moreover, in a style that makes it very easy to read, and illustrated well to me the tragedy of not giving young people in high school a more complete view of history. As I recall, even in the 1950's when I took history, we students could sense that the view presented was unrealistic. After all that's been made public knowledge since the 1960's and with information so widely spread because of the media and films, today's young people must see immediately that their history books are ridiculously false representations of history. Many will feel contempt for the writers, their teachers, and the adult society in general, not a good thing. I hope this book encourages the situation to change. Note: I would be very careful, though, about how to teach history to pre-pubertal children. They too are aware that the world iscontains both bad and good, but for most of them, the face of the world they see is mostly supportive. I feel they should be allowed to continue with that as their dominant reaction, because at that point they need a sense of security to develop their personalities. They still may be informed that people, even people who once lived in their country, have not always cared about others as they should. Of course, now, with all the murders and crime that even young children see on television, that will not come as as great a surprise to them as it did to more protected children of previous generations. In any case, I hope school history books at all levels show both the amazing things that humans have accomplised as well as their ethical failures. During my profession as a professor of sociology in a Swedish university, I have many times been surprised of the lack of actual knowledge in terms of Swedish history my students have shown. And this excellent book, which is not only a theoretical discussion, but rather, and more, a presentation of empirical material in terms of U.S.A, is terribly hurtful in a way that almost seems unbelievable! I mean; how is it possible that even textbooks also in North America actually present stupidity and childish lies? We do need these kinds of reports in order to understand our present day world!